Mr and Mrs Bradley of Winchester were the lucky winners of our Elliotts Living Spaces launch competition, for which they won £5,000 towards a kitchen, bathroom or bedroom. The husband and wife duo, whose home is currently going through renovations and having an extension built, chose to use their prize on a brand-new kitchen. Their interior designer, Debbie Caister, helped them select the Reno H-line design from Masterclass out of a huge range of interiors that also include brands such as ewe and Laura Ashley. “We’re currently in the middle of some serious home improvements so winning this competition has given our project a huge boost” said Mr Bradley. “Once we saw the kitchen in the showroom we didn’t look anywhere else and can’t wait to see it when it’s finished. We’d definitely use Elliotts Living Spaces again – they certainly ticked all of our boxes” he added. Mr and Mrs Bradley won the competition after visiting the Elliotts Living Spaces showroom at Romsey for a free consultation with one of our expert team members. They were chosen at random from hundreds of entries. Homeowners across Hampshire who are planning their dream interior can visit an Elliotts Living Spaces showroom at our Fareham, Lymington, Ringwood or Romsey branches for inspiration and a free consultation. Customers can come to any showroom and browse room sets showcasing many brands, suitable for all budgets. To find out more and get design inspiration, visit the Elliotts Living Spaces website. 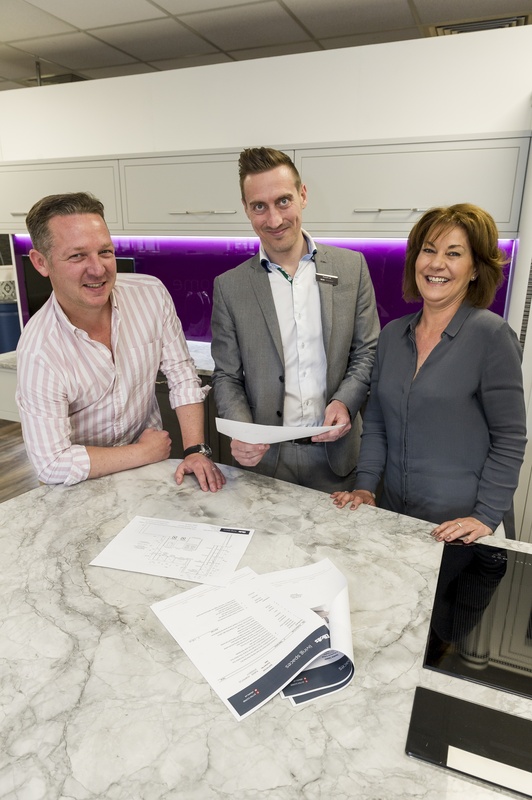 *pictured is competition winner, Mr Bradley, Elliotts Living Spaces Romsey showroom manager, Russell Lait, and interior designer Debbie Caistor.